Moving into any new city can be frightening – navigating new streets, finding a new home and making new friends. Nowhere is this truer – and more daunting -- than in New York City, with its eight million people, culture, bright lights, and beautiful skyscrapers. There is nothing quite like living in Manhattan. But before these NYC transplants can truly set up residence, there are a few rites of passage every soon-to-be New Yorker must first experience. You’re not a New Yorker until you live in an apartment small enough to touch both walls at the same time. After all, New York is known for its high cost of living and tiny living spaces (the city’s median asking rent, according to the real estate website StreetEasy is $2,690.). Our bovines aren’t complaining–Manhattan has anything you could need at your fingertips, err, hooves. Walking. And walking some more. Moving to New York may be the best exercise plan ever. Still a student of the art of taxi cab-hailing, the Cows are learning that “hoofing it” is sometimes the only – and often quicker – way. While still enjoying the sites during a stroll down 6th Avenue in the Garment District, pretty soon these Cows will be a black-and-white blur, moving at lightening-speed, just like the natives. 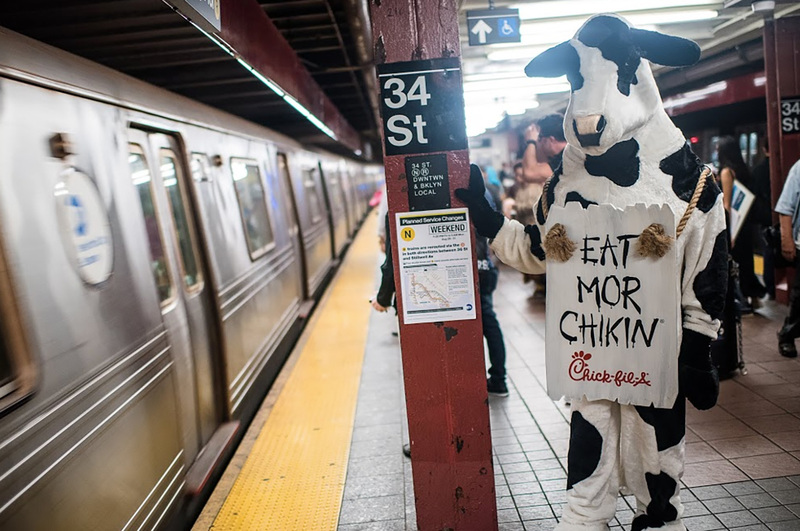 It's the largest system of track in North America - 842 miles - and with the third busiest stop in New York City (Herald Square) right around the corner, the Cows are just getting started exploring all the places it can lead. What do people mean, “Meet me at the Flat Iron,” and where is it? (And surely they don’t mean a flat iron steak, right?) 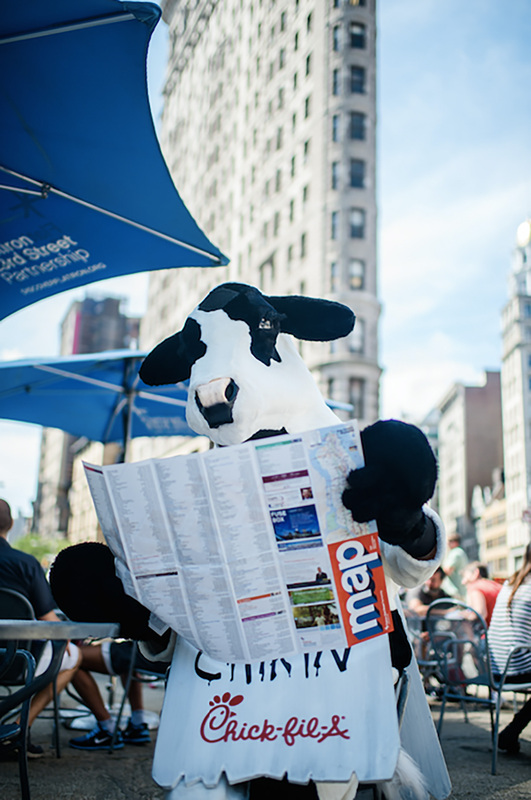 After a jaunt through Madison Square Park, the bovines need a break – and some directions. Chick-fil-A might be the newest place to get fresh healthy menu items, but it’s not the only one. Who says herbivores have nowhere to graze in the streets of New York City? What better way to wind down from the hustle and bustle in the city, than to get away from the herds and relax in the most visited park in the United States? While visitors to Central Park have likely seen just about everything here, these may be the first spotted Cows to grace the urban pasture. These Holsteins are feeling at home among these 843 city acres and is definitely here to stay. 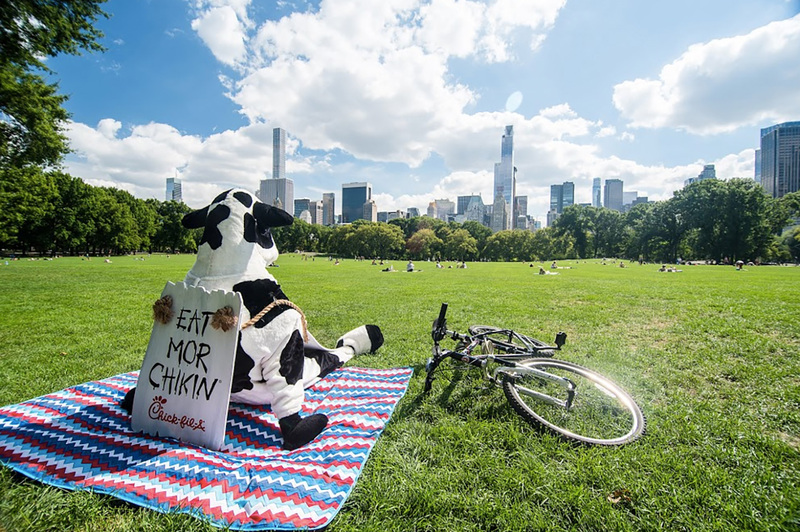 The Chick-fil-A Cow Campaign began in 1995, when renegade Cows painted the three words, “EAT MOR CHIKIN” on a billboard. Today, the Cows are seen on television, the internet, the occasional water tower and now, even on the streets of Manhattan. The fearless cows act in self-interest, realizing that when people eat chicken, they don’t eat them. 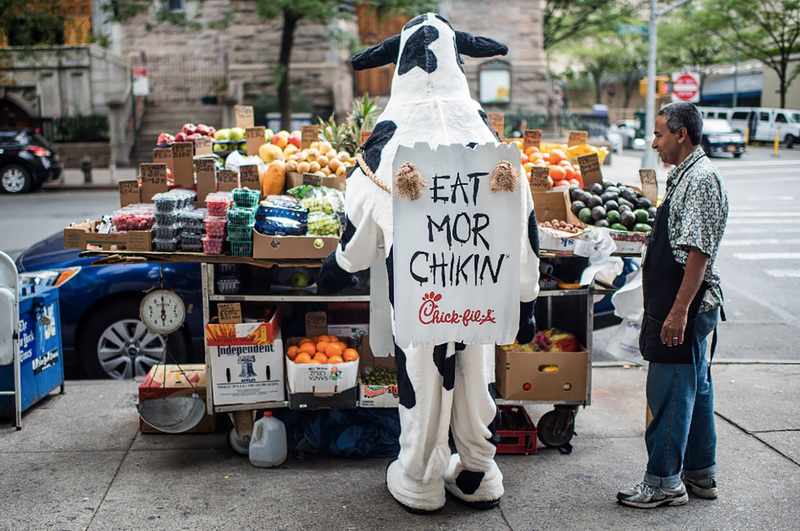 New York City has it all: theatre, museums, shopping – and in early 2018 four Chick-fil-As. 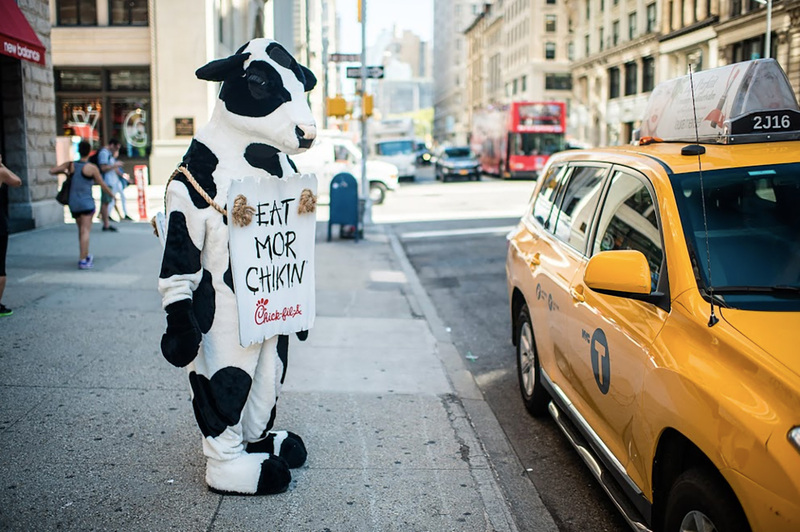 Just two years ago, Chick-fil-A opened its first restaurant in NYC, and now the “Eat Mor Chikin” Cows are putting on their suspenders, polishing their hooves and heading downtown as Chick-fil-A prepares to open its largest restaurant ever in Lower Manhattan.